Card Cody Nelson arches to 2nd in high jump. 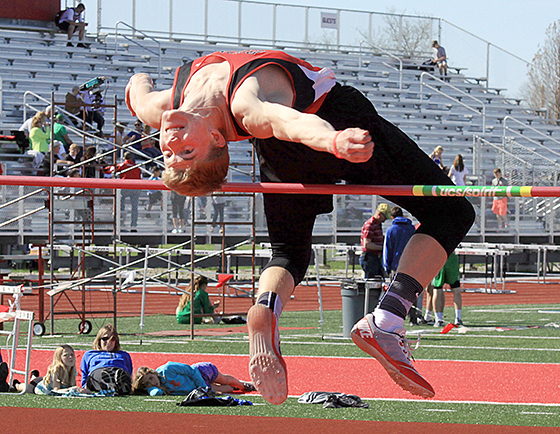 With the annual Mid-State Conference Track & Field Championships pushed back by weather conditions, the 2016 Jerry Seier Memorial Quad in Albion became somewhat of a tough one-day turnaround for Boone Central/Newman Grove athletes. Cardinal Coach Kris Pestel was pleased with how her athletes handled the challenge. “For the Seier Quad, which turned into a triangular due to the weather, our kids did some good things,” Pestel said. “Even though we had our conference meet the day prior, we were still able to have eight season bests by the girls and 15 by the boys. “We limited several kids who competed in multiple events at conference, but our younger kids did very well. The girls were able to finish second as a team and the boys finished third. Isaac Sullivan won the Seier shot put competition with a new Albion News area best mark of 50’2. Area leader Jared Zwiener took first in the pole vault, clearing 12’6, and Damian Backus matched his area best time (11.28) while placing second in the 100 meter dash. The Cardinal 4×100 meter relay team of Scott Ketteler, Kyle Kramer, Cody Nelson and Backus finished second to Scotus, but established a new 2016 area best time of 45.54. Three Lady Cardinals who lead area events were winners in the Seier meet. Ashlynn Baker swept the 1600 meter run (5:40.74) and 3200 meter run (12:38.07), Sheldon Beierman won the 300 meter hurdles (48.81) and Celine Dunlap took top honors in the pole vault (10’). Boone Central/Newman Grove will compete in the B4 District track & field championships Thursday at O’Neill, with berths to the 2016 Nebraska State Track & Field Championships on the line. Field event competition will begin at 11 a.m., with running events starting at 2 p.m. Running event finals are slated to start at 5 p.m.